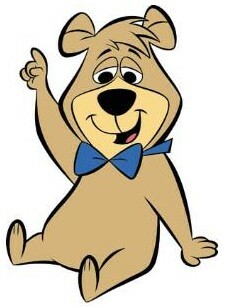 Boo Boo Bear is Yogi Bear’s side kick and best friend. They share in all sorts of adventures and usually end up in some kind of situation. Boo Boo is kind and patient and very well behaved when compared to his buddy Yogi. There are lesson to be learned for Boo Boo and a few of them are listed below. Try to always do the right thing – Boo Boo is a bear who always tries to do the right thing. He doesn’t like to get in trouble, and it’s not so much that he wants to avoid consequences, though that is part of it, he seems to be a naturally law abiding citizen of the forest. Sometimes adults make mistakes – If one sees Yogi as the adult in the relationship, or at least the elder to Boo Boo, it’s obvious that adults can make mistakes. Yet Boo Boo remains a friend to Yogi, no matter how big a mess Yogi creates. He understands that Yogi isn’t perfect and prone to mistakes. Sometimes it is good for our children to know that even adults make mistakes, and it doesn’t mean the end of the world when they do. Say what you need to say – In one episode where Boo Boo falls in love with Buttercup, he has a difficult time letting her know his true feelings for her. He ends up going through all kinds of crazy situations as Yogi tries to help him. In the end, he finds out that it is better if he can just say what he needs to say himself. Forgive those who treat you wrong – Yogi is always getting himself and Boo Boo in a world of trouble. Boo Boo, however, is always quick to forgive his friend. He never holds a grudge or retaliates. Being able to forgive another is a trait that everyone can benefit from developing. Follow the rules – Boo Boo does his best to follow Ranger Rick’s rules. Yogi, on the other hand, is constantly looking for a way around them. Respect the property of others – Picnic baskets are a huge temptation for bears, but they are supposed to leave them alone. Boo Boo understands this and is willing to respect that. It is critical to teach children to respect other people’s property. If it doesn’t belong to you, leave it alone. Don’t let others lead you astray – Try as he might to stay out of trouble, Boo Boo invariably gets in hot water because he is trying to keep Yogi out of it. It can be difficult to stay out of trouble when your best friend seems always to run headlong into it. Kids need to learn to resist the temptation of letting others lead them into trouble. Sometimes, this can mean letting go of a friendship. Always look your best – Ever notice how neat Boo Boo always looks in his little bow tie? Dress codes seem to be a thing of the past, but a person who shows up looking neat and clean will most likely always do better than one who shows up messy or unkempt. Be polite – Boo Boo is such a well mannered little bear. Ranger Rick appreciates Boo Boo’s pleasantness. Good manners really stand out in this day and age when they don’t seem so prevalent. Teaching kids to be polite and mind their manners will only add to their success. Patience is a virtue – Boo Boo has the patience of a saint when it comes to sticking by his friend Yogi. No matter what schemes Yogi contrives, Boo Boo remains calm and patient with his wayward friend. While you may not want to encourage your kid’s friendship with a trouble making child, helping your child to develop patience with others is worth the effort. There are many lessons to be learned by watching the cartoons and shows your kids watch. Analyzing what they are viewing and pulling out those teachable moments in a fun way can get kids thinking on a higher level.